Entertainer with quad-core power. The 16.4" Sony Vaio VPC-F13Z1/E with an Intel Core i7 740QM CPU and a Nvidia Geforce GT 425M graphic card promises strong performance. Find out how it performs in our row of tests and what this has to do with display spotting and whistling noises in our comprehensive review. 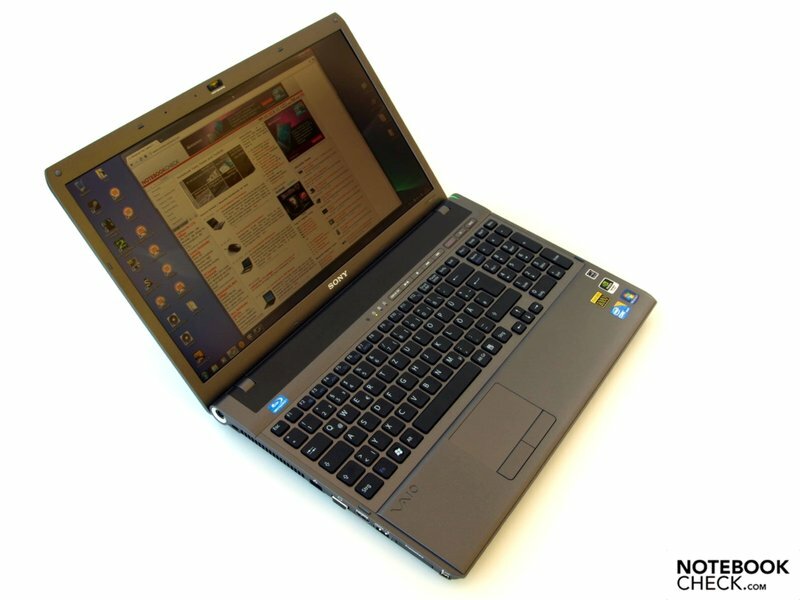 The F13z is unmistakably a F-series laptop. Here Sony hopes to score with high-performance entertainment computers. In addition to configurable notebooks such as the VPC-F13V5E or the VPC-F13XE, the series also carries among others old standbys like the VPC-F12Z1E/BI or the VPC-F11Z1/E, whereby the latter is no longer listed on Sony's website. All of the devices of the VAIO F-series currently on offer have a 16.4" display with full HD resolution as well as a Blu-Ray driver. A Geforce GT 425M takes care of the corresponding 3D graphics performance in many of the F-series devices including our tester. 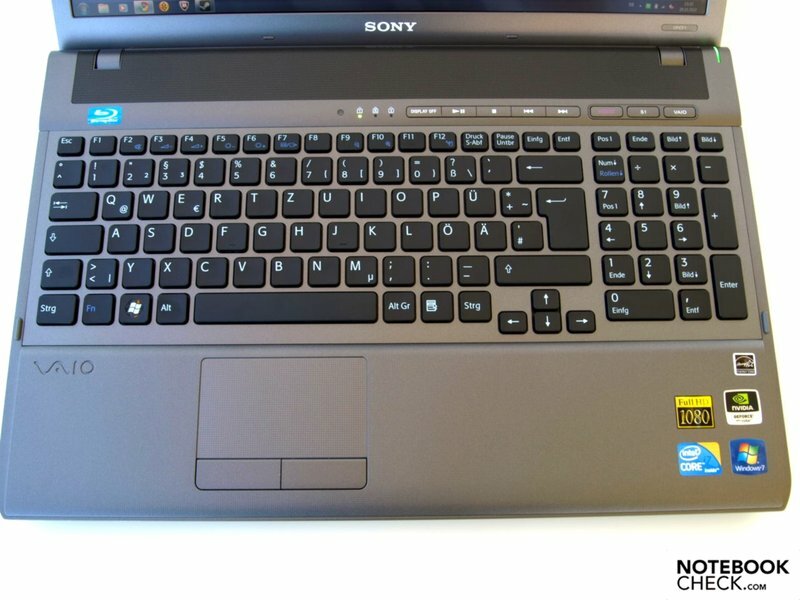 The Sony Vaio VPC-F13Z1/E in our review was also equipped with a fast 7200 r/min harddrive with 500 GB of capacity, eight GB of memory and a Core i7 740QM quad-core processor from Intel. Visually, the case resembles other previously reviewed F-series models such as the F12Z or the F11Z1/E. Due to the massive case measuring h: 31 w: 387.2 d: 263 millimeters, a weight of three kilograms and additionally nearly half kilogram for the power adaptor, the 16.4 incher will sure see more duty on the tabletop. The stability and construction leave nothing to be desired. Gripping with both hands, we could only bend the base unit a small bit by applying force. The base plate is of smooth plastic. All the surfaces are stable here as well, apart from the area under the optical driver. This can be easily dented. The palm rest and touchpad only give somewhat under significant pressure in isolated spots. Furthermore, the display lid holds up to pressing and twisting forces very well. The matte and hard-wearing, black or gray surfaces of the case are nice. The palm rests for instance are formed differently than those on the F12Z. The hinges hold the black lid securely in position and hardly allow it to teeter after adjusting the opening angle. The maximum opening angle is around 140 degrees. The joints are relatively stiff so that one-handed opening is no longer possible. 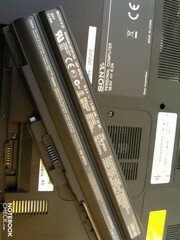 The Sony Vaio VPC-F13Z offers two USB 3.0 connections on the right edge of the case toward the front. With that we have the only difference from the VPC-F12Z in terms of interface equipment. This had to make do with 2 USB 2.0 connections in the same position. Moving forward we find two audio speakers, namely a stereo mini socket and a combined stereo-, mini and optical audio port for the headset connection. 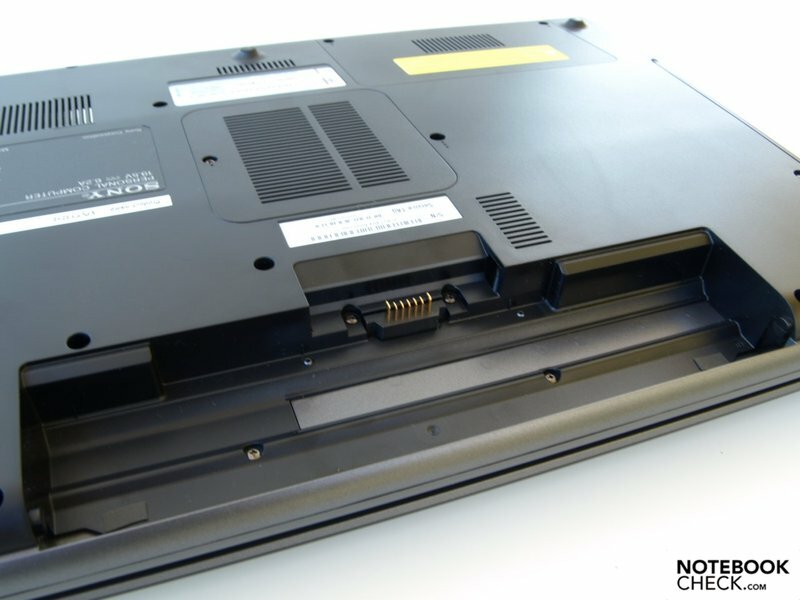 To the left is an ExpressCard/34-slot for expanding the range of functions and an i.LINK (4-pin, IEEE 1394, FireWaire) interface in the front area, which can be used for instance to hook up a battery camera. Behind that is a combined eSATA/USB 2.0 connection. Finally in the middle you have a HDMI for digital picture and sound transmission as well as a VGA port for analogue connections of external monitors or beamers at your disposal. After that there is a RJ-45 (LAN) port, which is also in the middle area of the left edge. Finally, the front edge offers a slide switch for hardware control of the wireless modules and two card readers, namely one for Memory Stick Duo (Memory Stick PRO-HG compatible with MagicGate function) and one for SD memory cards (SDHC, SDXC compatible, copy protections CPRM). Overall, the interface arrangement is not optimal for either left-handers or right-handers and depends heavily on the occupation of the ports. Tethered Ethernet connections can be made via the Marvell Yukon 88E8057 PCI-E Gigabit Ethernet Contrller (10/100/1000MBit). 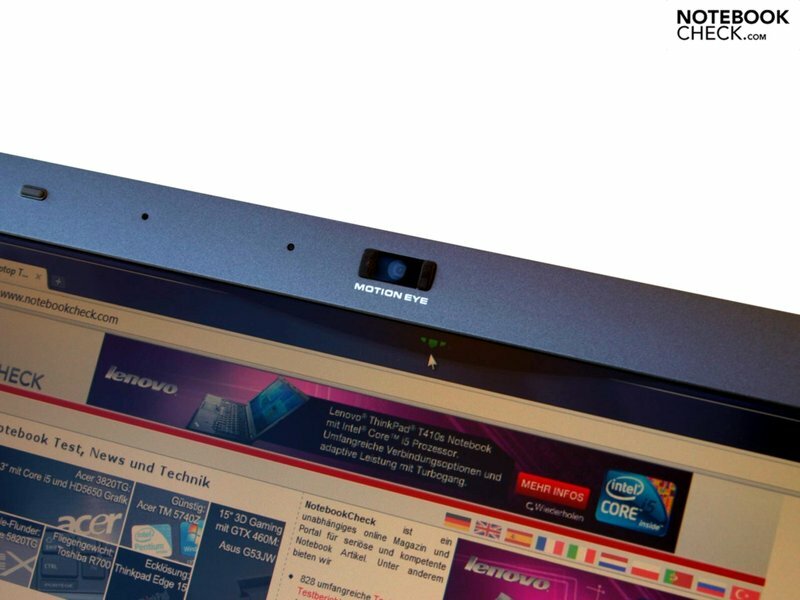 The integrated Intel Centrino Advanced-N 6200 AGN (abgn) WLAN module allows for fast network connections via WiFi-Hotspot when in conjunction with the appropriate infrastructure. Additionally, data can be transferred from small devices like PDAs or mobile phones via the Foxconn-T77H114-BCM2070 Bluetooth module (version 2.1+EDR). In addition to the essential accessories such as the power cable, power adaptor and battery, the carton also contains a few thin information booklets. These offer compact and useful information, for example about security and recovery. 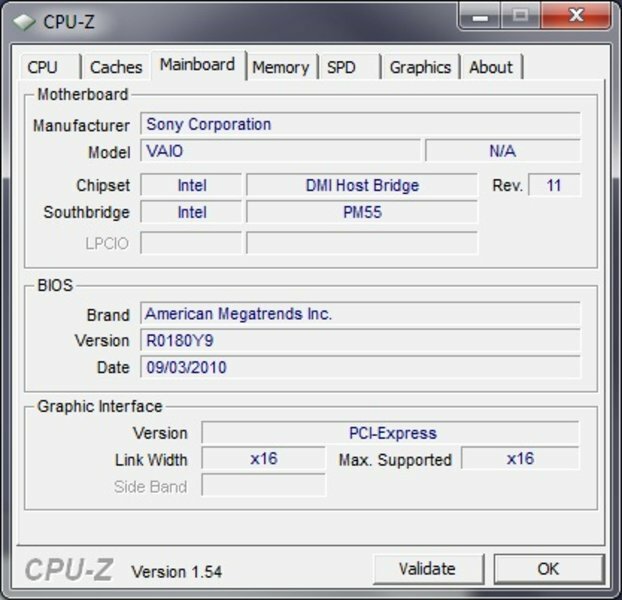 The user is responsible for setting up the recovery data medium and can do this his/herself using Sony's own easy-to-use tool. 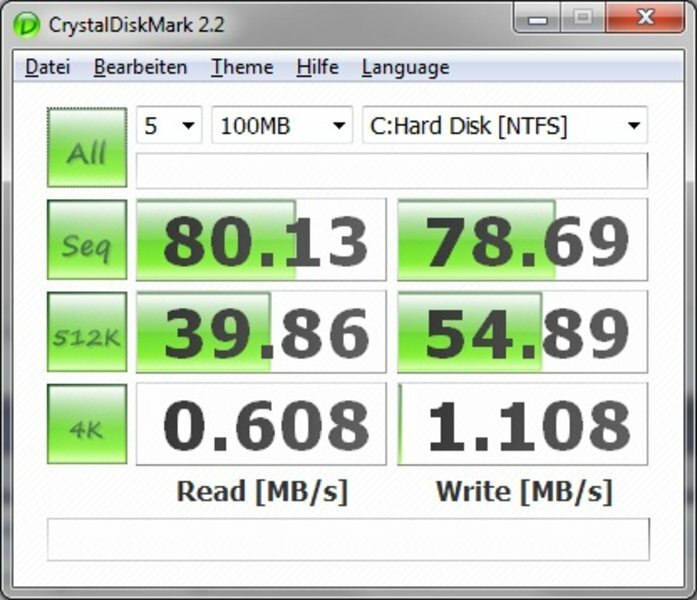 In addition to that, the ex-works setting of cached harddrive partitions can be restored. For that the user only needs to click the "Assist" button after start-up and then to follow the further instructions. A wide offering of additional at-cost accessories can be found on Sony's website. In addition to replacement power packs, bags, various mouses and a Bluetooth keyboard, there is also a larger battery with 7500 mAh of capacity for a full 199 Euros (Austria) on offer. This is housed underneath and gives the notebook a slight tilt. It offers 50% more capacity than the standard battery with 5000 mAh, which should have should effect the runtimes in similar conditions. The warranty differs depending on the country. In Austria for instance, the standard guarantee period is 2 years. In Germany this only applies to those models which were bought at an authorized Sony dealer (only 1 year for all others). In Great Britain on the other hand the guarantee period for the F13Z is only 1 year as Windows 7 Home is installed. A standard guarantee there only extends beyond 2 years for models with pre-installed Windows 7 Professional or Ultimate. In any case the guarantee can be extended everywhere at additional cost. 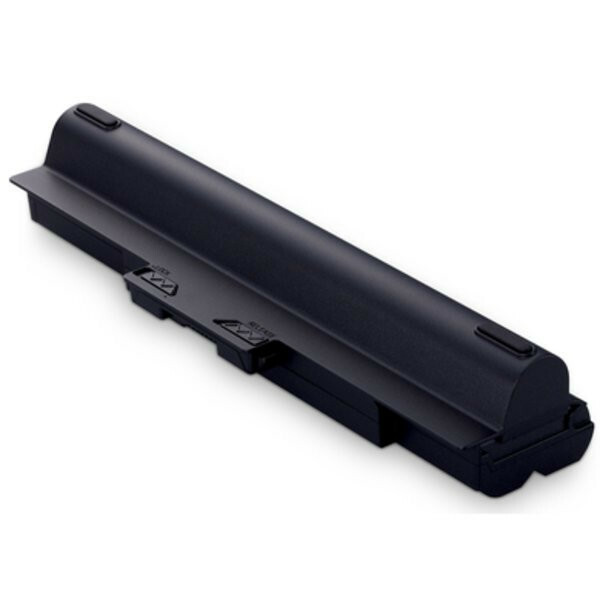 The input devices are similar to those from other F-series laptops such as for instance the F12Z or the F11Z1/E. 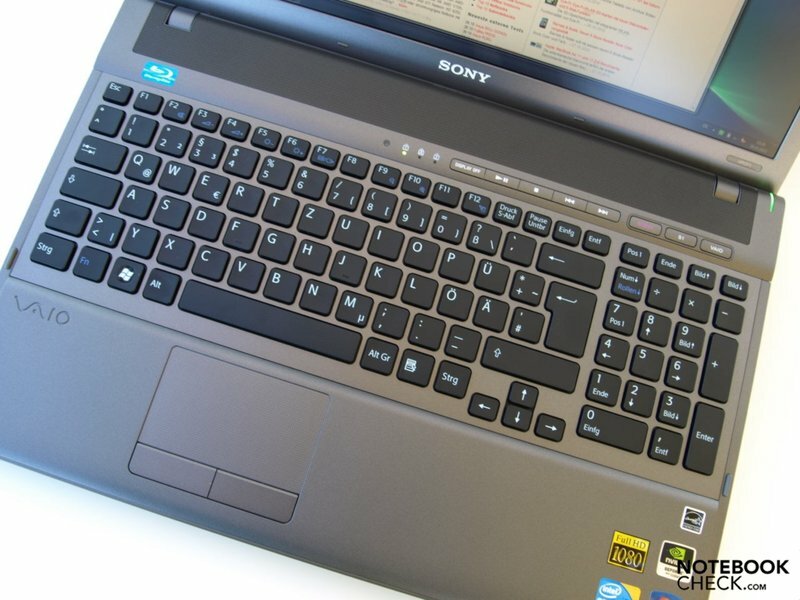 Sony uses a so-called chiclet keyboard, or in other words a design with individual keys. The keyboard offers the writer a very clear pressure point, a long key stroke and a solid stop. In addition to the generous layout, those are the most important criteria for frequent typists. The sub-construction is solid so that the keyboard sits securely across its entire width. Even above the optical driver (numeric keypad), the keyboard only gives a small bit under relatively strong pressure. 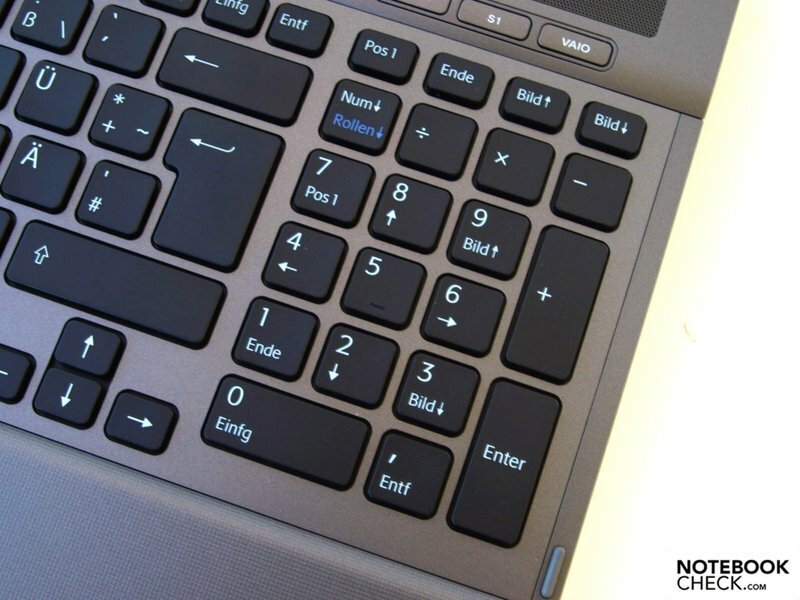 The numeric keypad makes inputting numbers and using the calculator easier. The clearly offset arrow keys are a plus-point. While these are scaled-down, the finger can still find them without the user having to look. 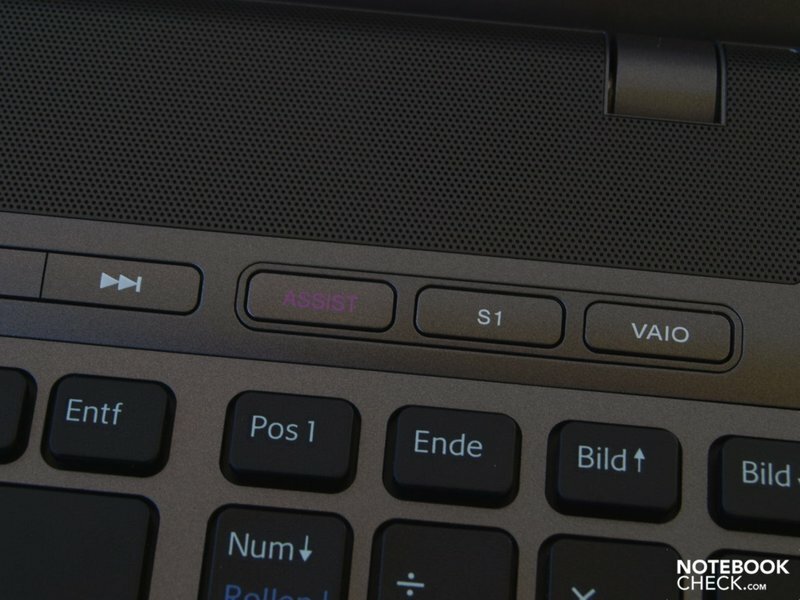 Beside the multimedia elements, one can use hotkeys to turn off the display (Display off button) and start the media gallery (Vaio button) or Vaio Care V6.2, a tool for recovery and error corrections (Assist button). 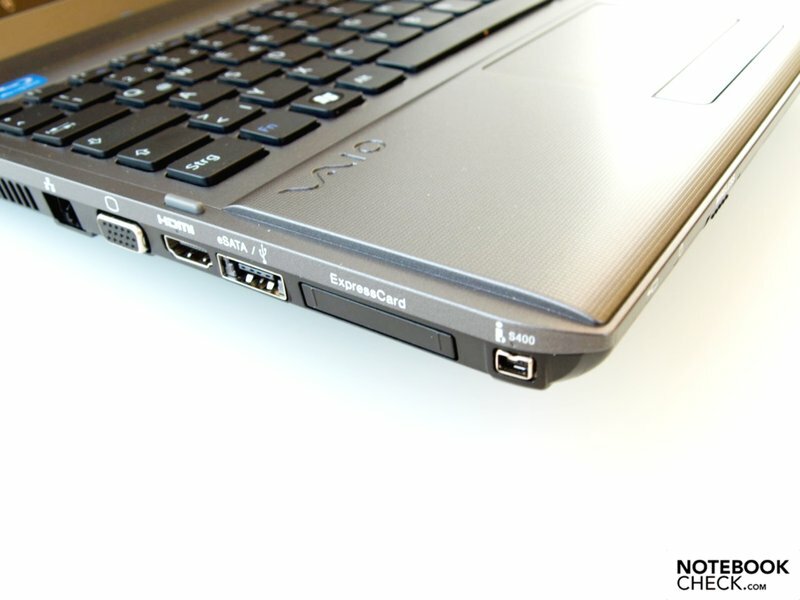 In addition to that, the S1 button starts the Vaio Control Center as standard. But it too can be configured for another control destination. 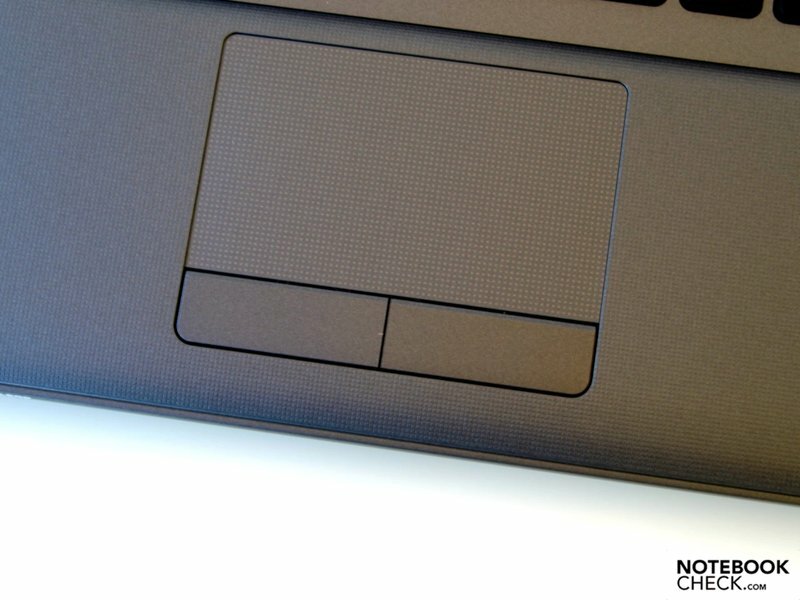 The roughly 80x50 mm touchpad doesn't quite match the keyboard in our opinion. The Alps-Pad has a matte, though relatively smooth surface which offers hardly any resistance for one's finger. The cursor can be precisely controlled. The surface has horizontal and vertical scrolling areas although these aren't marked visually or by feel. Multi-finger controls are supported in principle, although scrolling with two fingers is not. The corresponding keys have a short stroke and are clearly located in the center. Their clicking noise could be quieter. 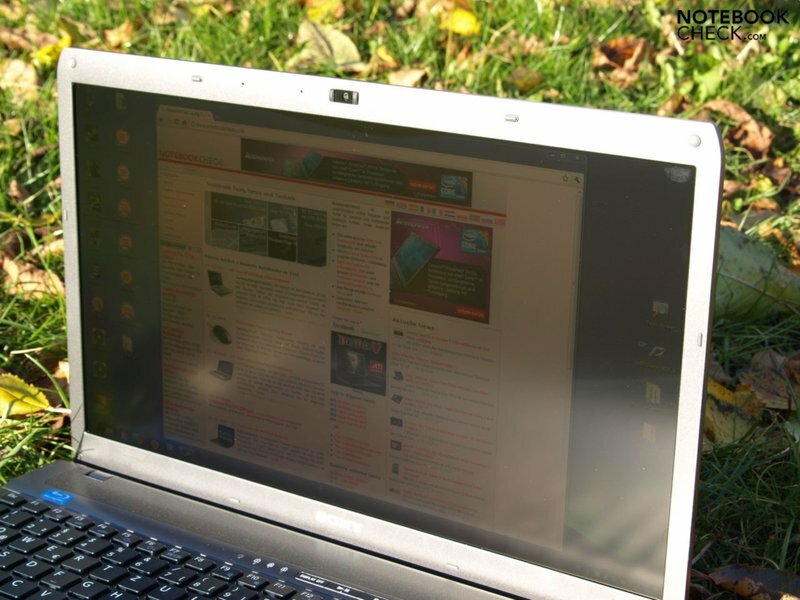 The Vaio F131/E has a full-HD display screen with a high resolution of 1.920x1.090 pixels. It therefore offers a film-friendly 16:9 format. As it is an anti-glare panel, it is also suited for use at VDU workstations. The comparably large portrayable color space of the display employed (MS_0025) is impressive. sRGB and AdobeRGB are covered relatively well. It easily outdoes the slim color space otherwise typical for notebooks. 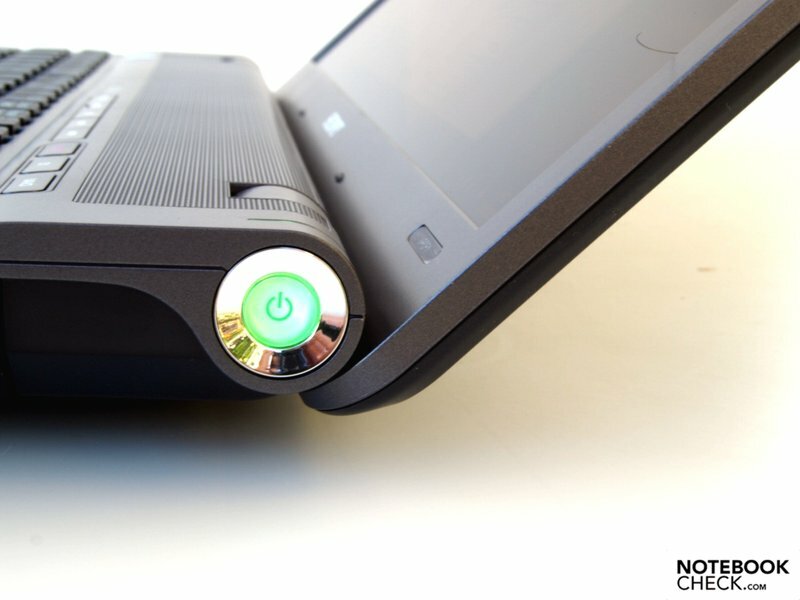 The Dell XPS 16 with its RGB LED display does perform better however, as does the Thinkpad W510 with a RGB display. 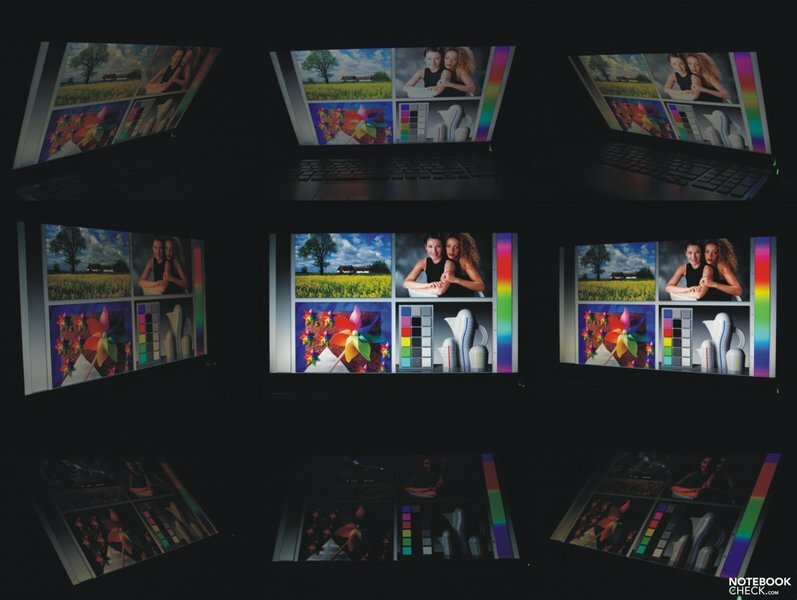 However overall, the F13z is much more suited for ambitious photo and graphics users than the bulk of consumer and business notebooks. According to our measurements, the display achieved a maximum brightness of 248 cd/m² in the middle picture segment. Unfortunately the brightness falls off more or less significantly on all sides and due to a minimum of only 172.5 cd/m² it achieves a sub-average illumination of only 70%. Especially critical eyes may already notice shading in the areas around the corners when viewed against bright display backgrounds. But the average user will be able to cope with this weakness. At least on our tester we didn't notice any annoying spotting. On the other hand, the monitor does score points with a low level of black (0.44 cd/m²) and an outstanding maximum contrast of 564:1. Black therefore seems full and the colors powerful and lively, this despite the anti-glare display surface. The Sony F13z before us shapes up much worse than the F12Z, above all due to the distribution of brightness. Not only does it clearly loose out to that model in the display rating but as a further consequence in the overall rating as well. If the "automatic brightness setting" is activated, an ambient light sensor automatically adjusts the brightness to the lighting conditions in order to save energy and to give the eyes a rest. Under sunlight for instance, the maximum brightness is chosen automatically without the user having to step in via the Fn keys. The brightness sensor was deactivated to test the battery life and the current consumption as well as for field photographs. We can not confirm reports about the brightness sensor which cannot be deactivated. Our test measurements in dark surroundings as well as under studio lighting showed results which were within the expected tolerances. The anti-glare surface proves to be a success in outdoor use as no annoying reflections show up and the display remains quite legible, at least from optimum viewing angles. In a worst case scenario, diffuse reflections are perceptible (see frontal picture under sunlight). But depending on the incidence of light and viewing angle, one might wish for a somewhat brighter and more evenly illuminated display. One would expect stable viewing angles from such a high-end multimedia notebook. Horizontally, things are indeed sound. The stable working space along the verticle axis is on the other hand much more limited. 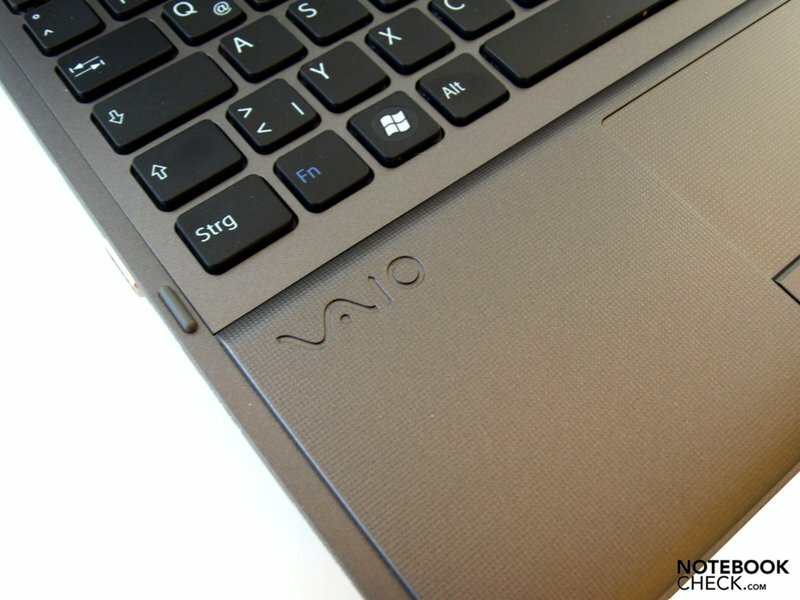 The Vaio F13Z is based on the PM55 Express chipset from Intel. Equipped with a Core i7-740QM, it has a high-end quad-core processor for notebooks on board which has a relatively low clock rate of 1.73 GHz and offers 6MB L3 of cache. But thanks to Turbo-Boost technology, the CPU is capable of overclocking an individual core up to 2.93 GHz as long as the cooling performance of the laptop is up to the task. With help of Hyperthreading, the Core i7-740QM can run up to 8 threads simultaneously, thereby making more efficient use of the processor pipeline. 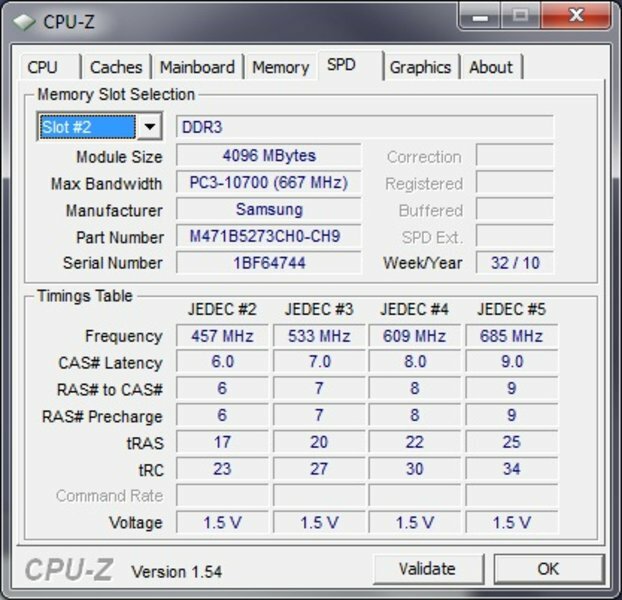 The 740QM has an integrated memory controller which operates DDR3 1066 and 1333 memories directly. 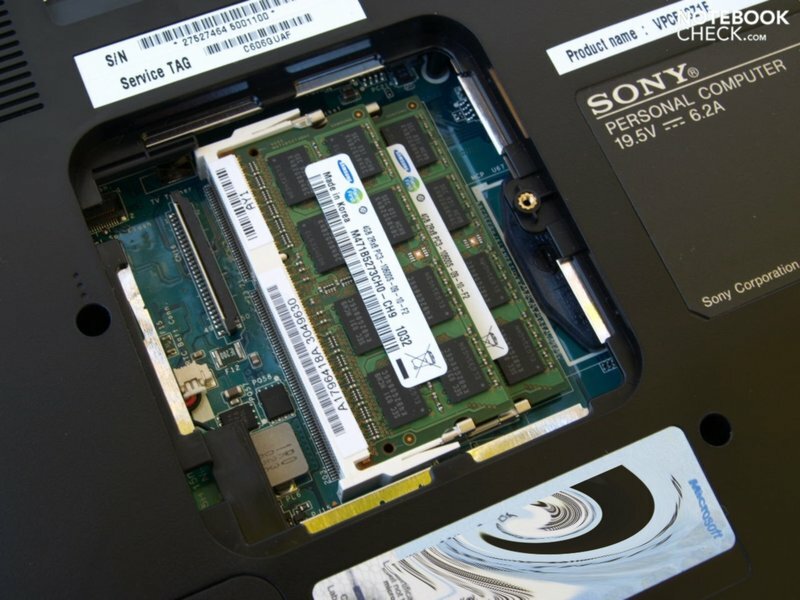 Our test model offers the maximum memory upgrade of eight gigabytes, those being in the form of two four GB DDR SDRAM bars - PC3-10600 (1333 MHz). 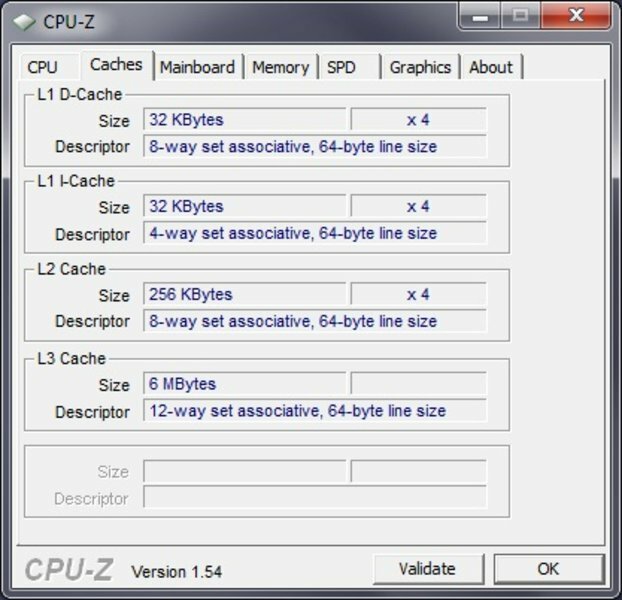 And with the 64 Bit version of Windows 7 Home Premium, this large amount of memory can be fully addressed and used efficiently. 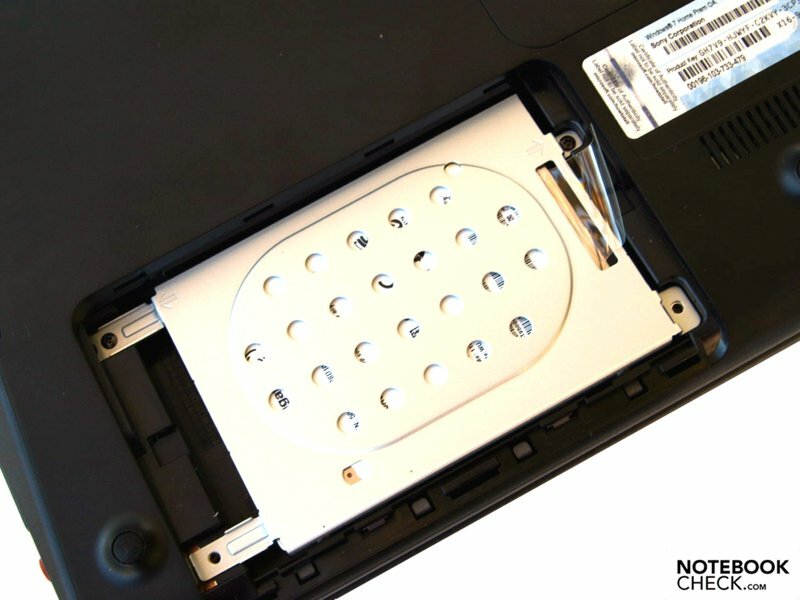 What's more, the main memory can be easily accessed via the service flap on the underside. 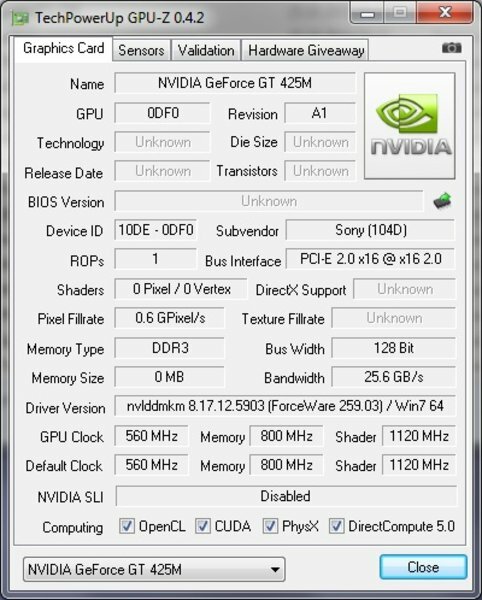 A Geforce GT 425M graphic card from Nvidia is responsible for processing picture output. Based on the GF108 core, this mid-range graphic card supports DirectX 11 and OpenGL 4.0. It also offers bitstream transmission of HD audio (Blu-Ray) through a HDMI connection and supports video decoding with PureVideo HD. Thanks to CUDA, DirectCompute 2.1 and OpenCL, you can also set in Shader Cores for general computing (z.B. video transcoding). Advanced physics can be translocated to the GPU using PhysX, though the performance of the GT 425M is not enough to process 3D graphics with high details or the physic-effects in modern 3D games. 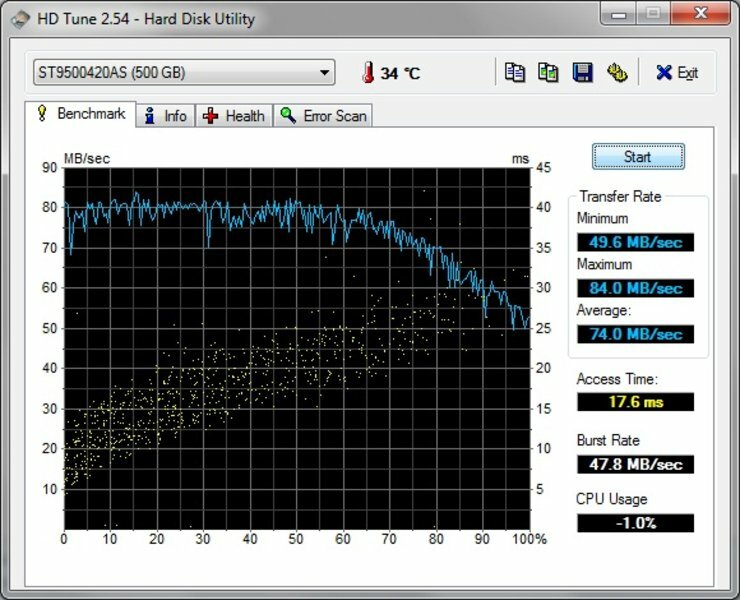 We use the PCMark Vantage test to evaluate the interplay of CPU, graphics, memory and harddrive, or in other words the application performance. Our test candidate achieved 5997 points and is thus on about the same level as the Dell Studio 1558 (520m, GMA HD, 5929 pts.) 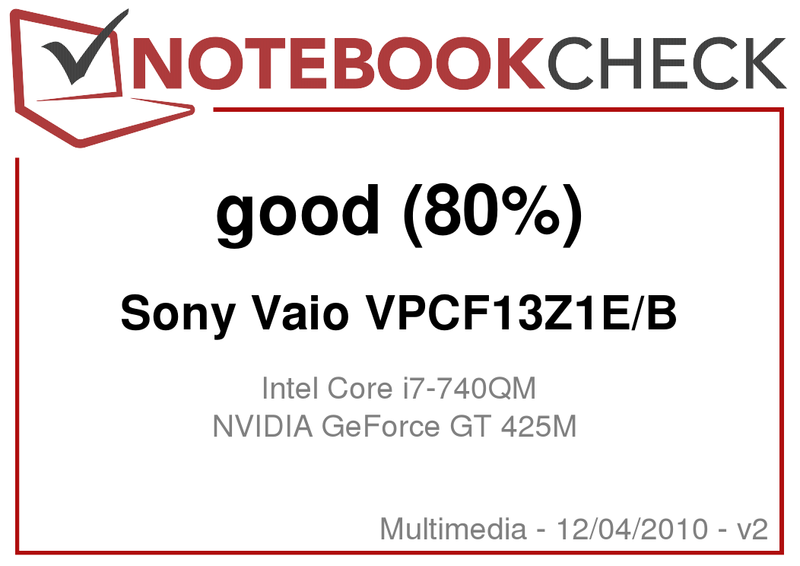 the Sony Vaio VPC-F12Z1E/BI (740QM, GeForce GT 330M, 5942 pts. 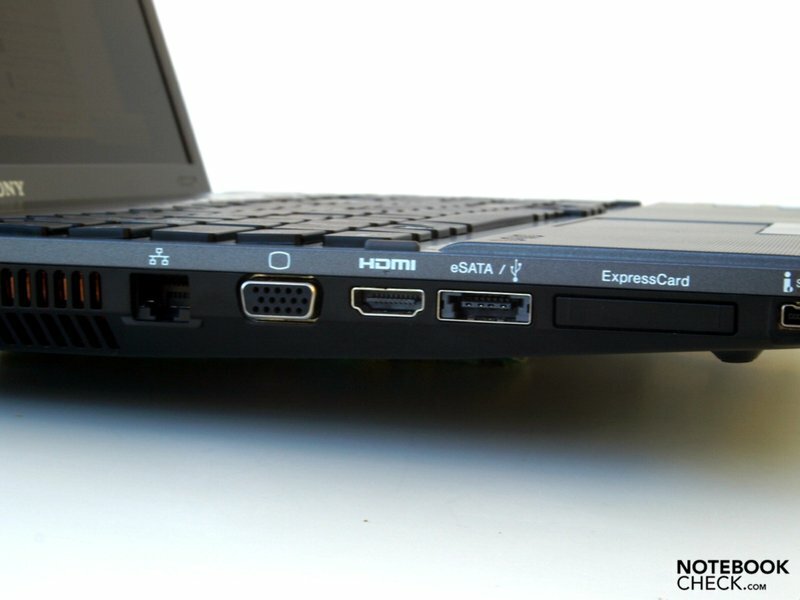 ), the MSI GX660R (740QM, Mobility Radeon HD 5870, 5985 pts. 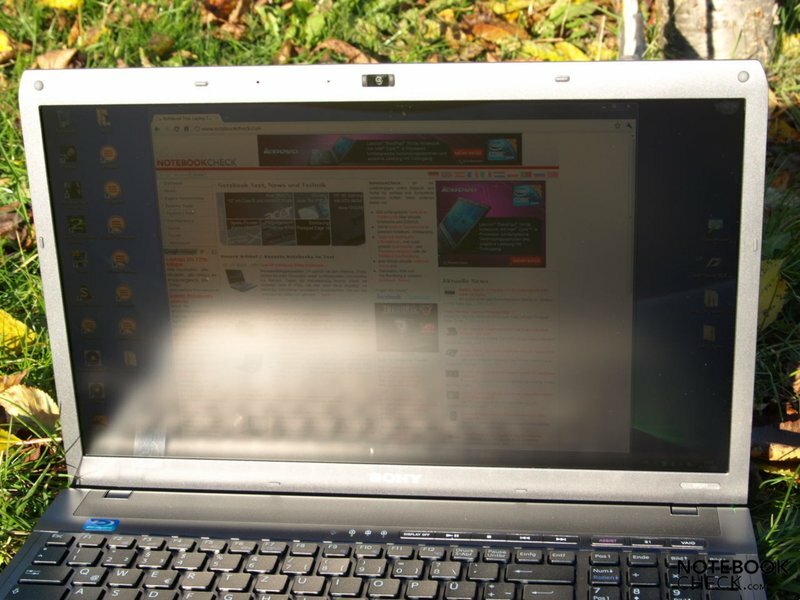 ), the Lenovo IdeaPad Y560-M29B3GE (720QM, Mobility Radeon HD 5730, 6012 pts.) or the Samsung NP-R580-JS03DE (520M, GeForce GT 330M, 6026 pts). 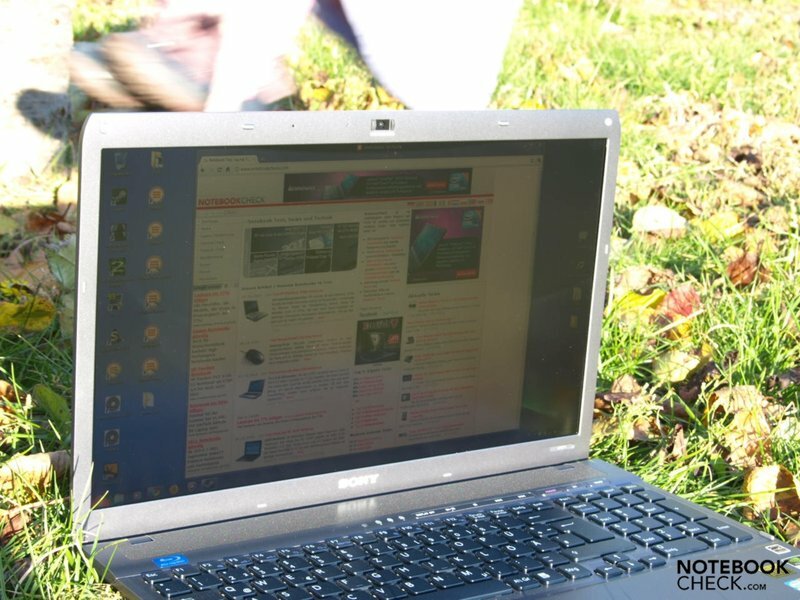 The recently reviewed Acer Aspire 5745DG 3D-Notebook with the same CPU and GPU achieved an only slightly lower overall score of 5864 points. The comparably strong graphic card had very little influence on this. The high rating is rather attributable above all to the fast 7200 rpm harddrive. We checked the graphics performance using numerous versions of the 3DMark. Here our tester achieved for instance 3457 points in the 3DMarkVantage and is neck and neck with the Acer Aspire 5745DG 3D-Notebook (same CPU and GPU, 3424 points). The difference between it and the HD 5650 in the Deviltech Fire DTX (720QM, Mobility Radeon, HD 5650, 3450 pts.) is also negligible. The system disk employed is a Seagate ST9500420AS. This offers a gross capacity of 500GB and works with a rotational speed of 7200 r/min. It went through the performance tests without any abnormalities. A Blu-Ray burner is at hand as a second mass media device. More specifically it is a BD-RW BDR-TD03 from Pioneer. 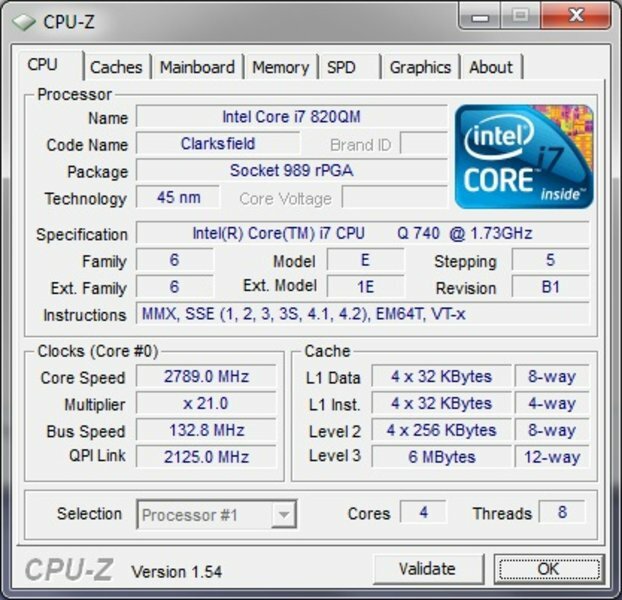 Considering the synthetic 3DMark benchmarks already discussed above as well as the comparable equipment, one would expect that similar results as those of the Acer Aspire 5745DG 3D-Notebook would be possible in the practical gaming tests. Because the F12Z is equipped with a weaker Geforce GT 330M graphic card, it comes out somewhat weaker across the board in the gaming tests. 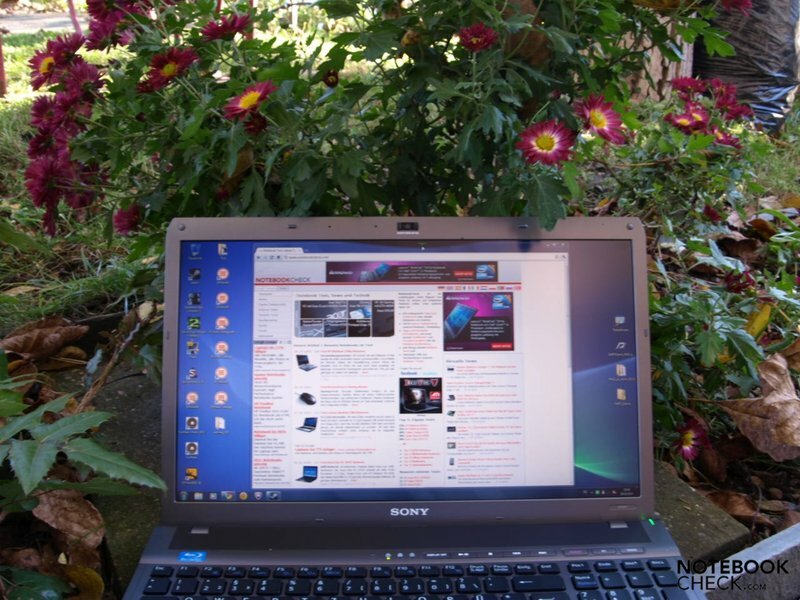 For a performance comparison with HD5650/dual-core systems, we put the Sony F13Z up against the Acer TravelMate 7740G-434G50Mnss (Fifa 11) as well as the Acer Aspire 4820TG-434G64Mn (Dirt 2, Risen, Bad Company 2, Modern Warfare 2 & Shift). In high details and 2x AA (antialiasing), the combination of GeForce GT 425M and quad-core CPU surpases a combo of Radeon HD5650 and dual-core CPU (33.9 to 24.9 fps) by 36%. The Sony F13Z achieves an average framerate of 31.6 fps with high details and 4xAA and is thus somewhat higher than the Radeon 5650 with 29.9 fps. With 25.8 fps in high details, the F13z achieves a marginally higher image refresh rate than the 3D notebook from Acer and is thus just on the limits of playability. 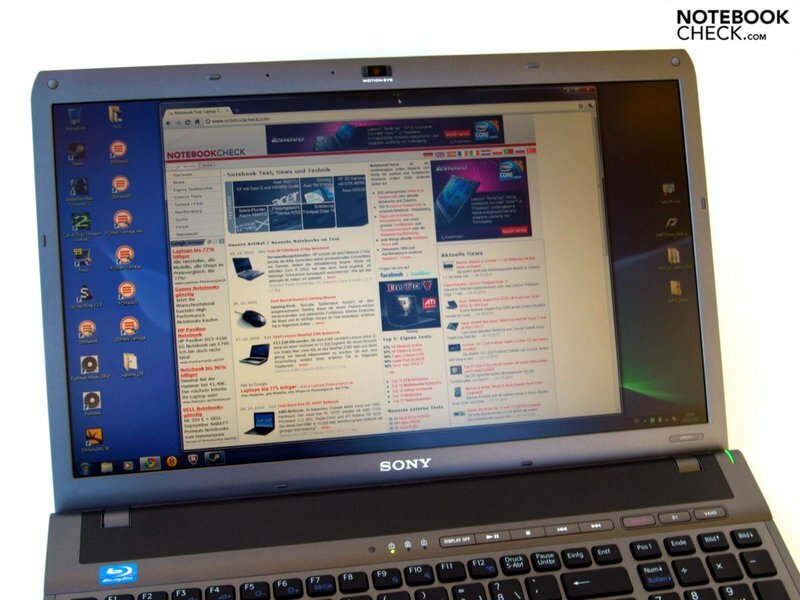 Still, it is clearly surpassed by configurations with Radeon HD 5650. With 21.32 fps in high details and 4x AA, there is no chance of achieving an acceptably fluid gameplay. 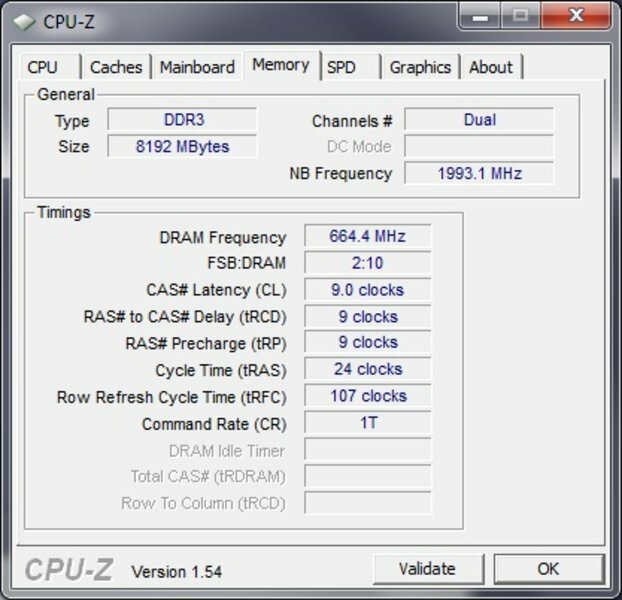 Systems with Radeon 5650 come out similarly. The Sony F13Z achieved an average of 38.4 points in high details and 4x AA in testing, whereby the game could be considered playable. The ego-shooter runs about a fast with Radeon HD 5650, which can put up 37.9 fps. As can be seen from the image refresh rates, Fifa 11 doesn't put any particularly high demands on the hardware. This game is the only one in the test which can also be run jerk-free with ultra settings, in other words with a native resolution of 1920x1080, ultra details and 4x AA. The expectations were fulfilled. 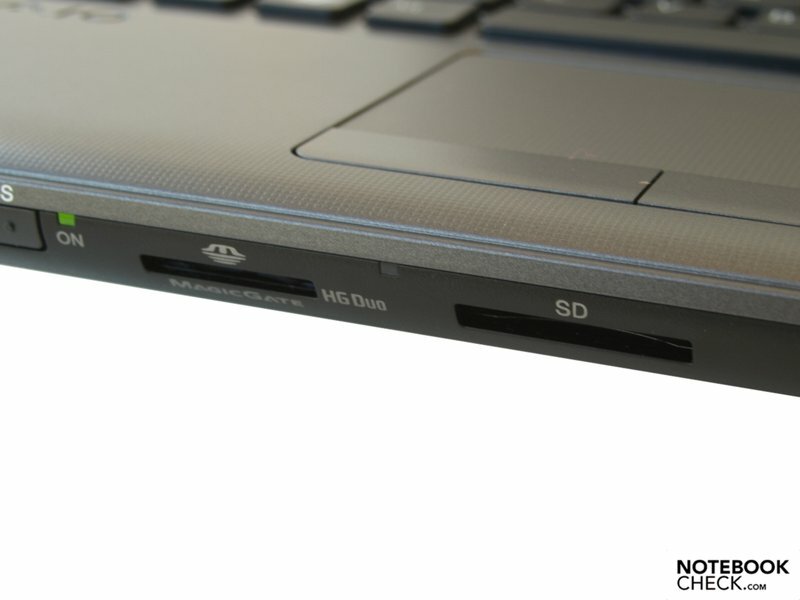 In terms of gaming performance, the analogue results match those of the Acer Aspire 5745DG 3D-Notebook. The gaming performance is solid. Most middle to higher details are possible with a resolution up to 1366x768 pixels. Apart from Fifa 11, playing with a native full-HD resolution on high details will no longer produce an enjoyable gaming experience. Overall, the GT 425M and ATI Radeon HD 5650 are on about the same level, whereby the better performance of one card over another is dependent on the particular game. The Geforce GT 425M graphics card is therefore a serious DirectX 11-capable competitor to the ATI Mobility Radeon HD5650. Considering its high-performance hardware, we assumed at the outset that the F13z would not work whisper-quiet. At idle, the operating noise is already quite loud at a maximum of 38.4 dB(A). The noise also swells softly up and down continually. Compared to the F12Z, no substantial improvements have been made here. There are still relatively significant volume fluctuations at idle. Beginning at a medium fan rotation, the sound picture is mixed with a fine, high-frequency drone. We measured a volume of around 46.1 dB(A) during the gaming tests, and level which could rise to a maximum of 50.3 dB(A) in the stress test. In all states of load we experienced an uneasy up-and-down swing at the respective rotational speeds, though the transition from the individual levels occurs smoothly. Depending on one's subjective sensitivity to noise, one could manage quite well with the F13Z. Opinions from our review staff about how annoying the fan behavior in fact was varied quite a bit. This was also the case for the whistle we observed, something that will stand in the forefront for many users. Sure, we could notice this whistling regardless of what level of load the device was under. We would trace that to the area of the fan. Short durations of high-frequency whistling pop up in irregular intervals and it is quite possible that many users won't even notice it. But we have consideration for the fact that sensitive ears will be bothered by this after some time. The cause of this noise has not been determined, but in our opinion it could have something to do with the fan reaching a particular oscillation frequency, which then briefly gives off an audible whistle. This would also explain the irregularity we noticed in practically all states of load. But on the other hand, the temperature development on the case surfaces remains within reason. 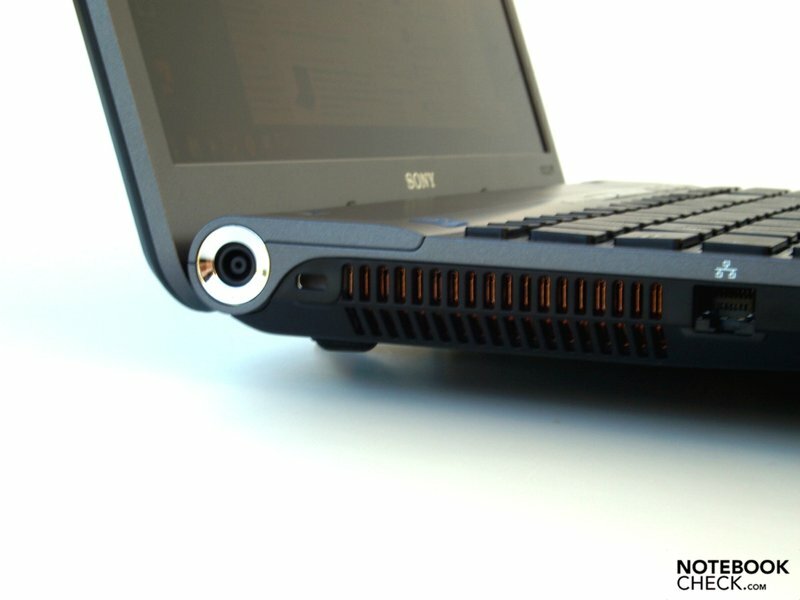 Under minimal load, the notebook stays pleasantly cool all around. When demands are increased, the temperature rises in turn. The F13z feels pretty warm in the area around the heatpipe and on some areas of the keyboard when playing 3D-intensive games. We measured 40.4 degrees Celcius near to the heatpipe after two hours of a stresstest. 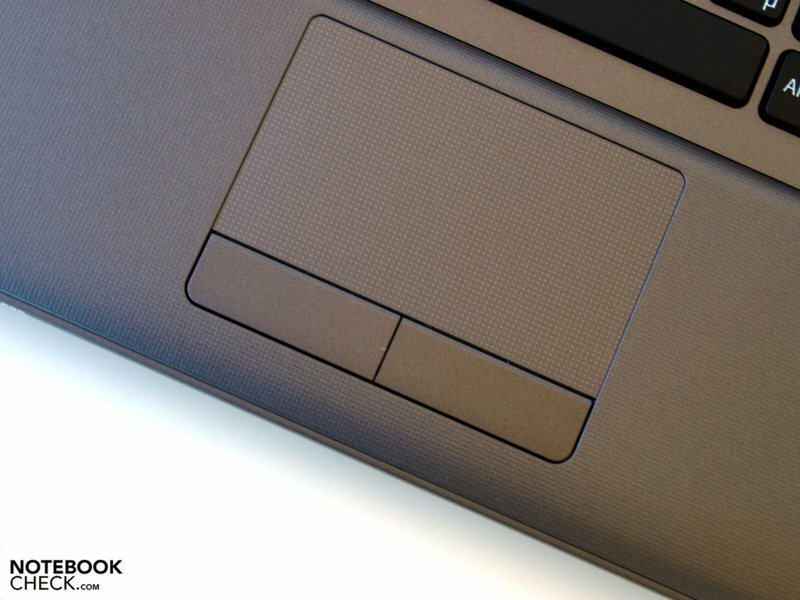 On top, the touchpad and some parts of the keyboard exceed the normal body temperature. The F13z nevertheless survived the 12-hour stresstest without any failures. All of the processor cores remain under the 80 degree mark and the graphic card doesn't exceed this either. Furthermore, the stresstest had no impact on performance. Apart from negligible variances, it got the same score in a 3DMark06 carried out directly afterwards as it did in normal operation. One can also refer here to the rating of the F12Z. The stereo loudspeakers above the keyboard are quite lacking in basses as there is no subwoofer. The sound is therefore concentrated in the middle, but remains undistorted even at maximum volume. Connecting external sound equipment or a high-quality headset allows for unmitigated music enjoyment. An analogue headset and SPDIF are available in combination so that a digital sound transmission is also an option. Our tester shows up with a 54 Wh (5000 mAh, 10.8 V) lithium-ion battery. Considering the potent internals, one shouldn't expect particularly long battery runtimes. For this reason Sony also offers a round 50% larger battery with 7500 mAh which should extend the battery runtimes tested here to 150%. The minimum battery runtime was determined in the high-performance profile with the WiFi modules turned on and display on maximum brightness. The Classic Test of the BatteryEater Tool showed us 67 minutes. Runtimes in practice will fall somewhere between these two values. 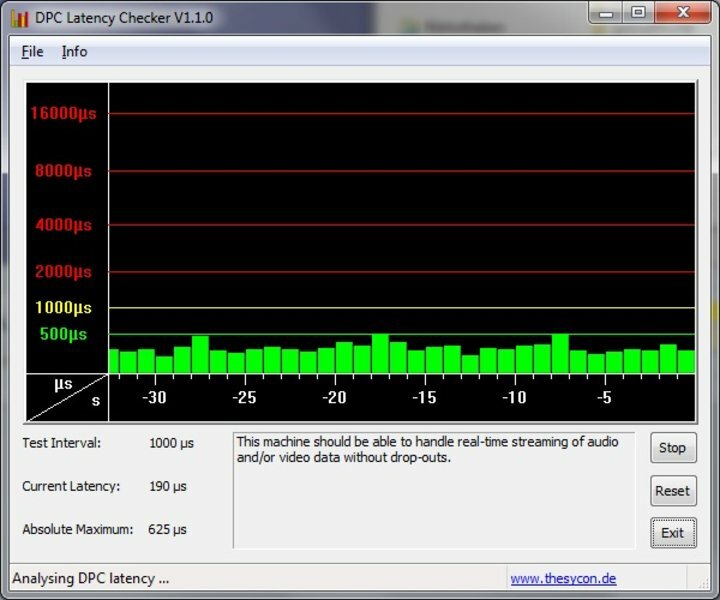 We could for instance research in the Internet for around two hours via WLAN with brightness levels set at 6/8. In contrast, the Blu-Ray test and the DVD test with maximum brightness and a "balanced" profile ended already after just over an hour. Quite surprisingly, both runtimes are only just over the minimum runtime. In contrast to the quite short unloading times, our tester needed a rather long time to fully reload the battery, which itself is not very large. We waited each time almost four hours until the device was ready for the next battery test. In terms of current consumption, the Sony F13Z behaves in a way befitting of it hardware equipment and without abnormalities. Still, the energy use at idle (20-30W) as well as under load (80-113W) is higher than dual-core systems by comparison and also explains the short battery runtimes of the notebook. Luckily, the values when turned off and in standby mode are low. The power adapter (output 19.5 V, 6.2 A - 120W) is sufficiently designed and thus never gets too warm, even under load. The Vaio VPC-F13Z1E/B with an Intel Core i7-740QM quad-core CPU, Nvidia Geforce GT 425M graphic card and eight GB of memory represents a potent multimedia device which allows for one or another games on middle to high settings, though aside from a few exceptions (Fifa 11), not in the native full-HD resolution. The robust and solidly built case leaves a good impression. We were also pleased by a matte, contrast-rich display with a large color space, though this could be more evenly illuminated. Also impressive was the interface equipment, which includes HDMI, eSATA, USB-3.0, SPDI and Firewire, though their arrangement on the case was less appealing. Connections and devices can be retrofitted through ExpressCard/34. 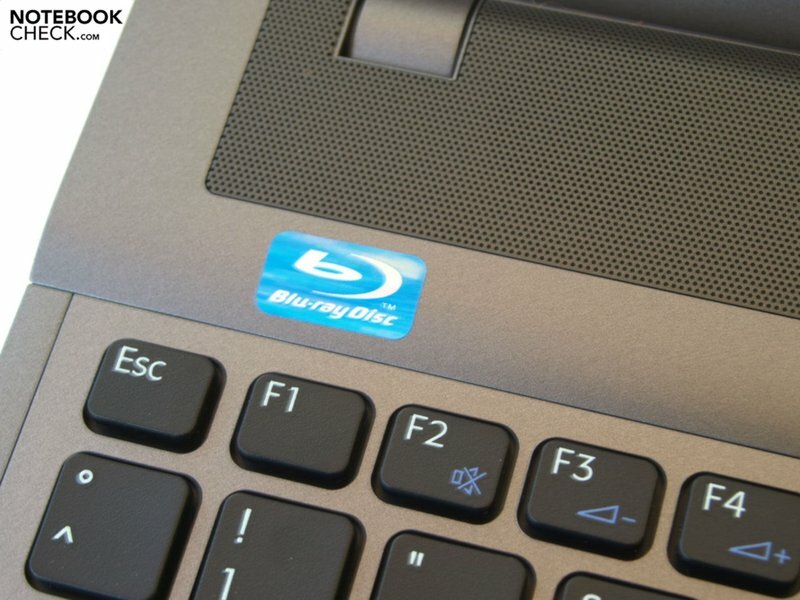 A Blu-Ray burner is also on board. The keyboard is well-suited for daily writing tasks thanks to its stable and clear execution. A offset numeric keypad also eases the task of inputting numbers. The cooling system of the tester was able to keep the temperatures inside the machine low on the one hand, but works somewhat uneasily and with a middle to high frequency parasitic noise on the other. Sony should resolve the whistling noise we noticed as soon as possible as sensitive natures in particular are strained unreasonably. The battery runtimes are, as expected, quite short. But for a heavy and potent 16.4 incher, which should in any rate be used more as a stationary device, this is less of a concern. 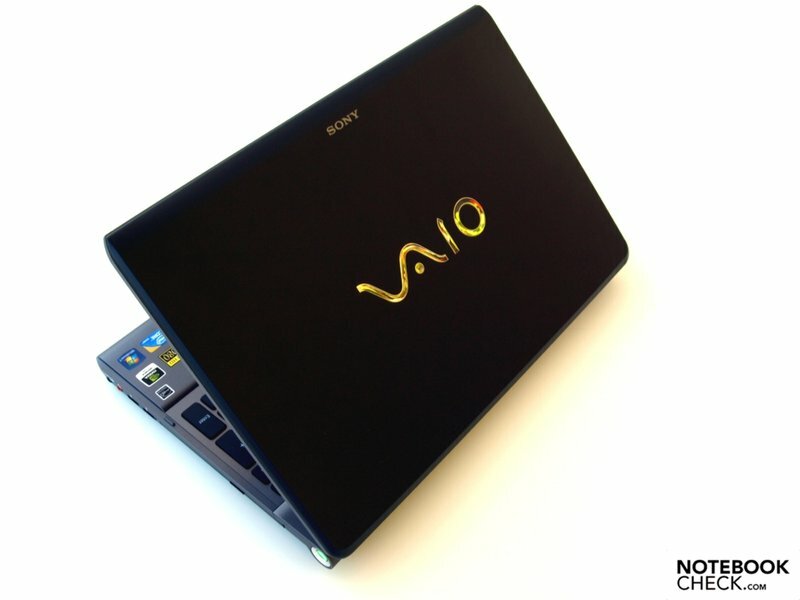 The Vaio F13Z was developed for ambitious power-users who want to do serious work with the notebook. Overall, we could recognize many good points for this concept, above all in terms of the display. 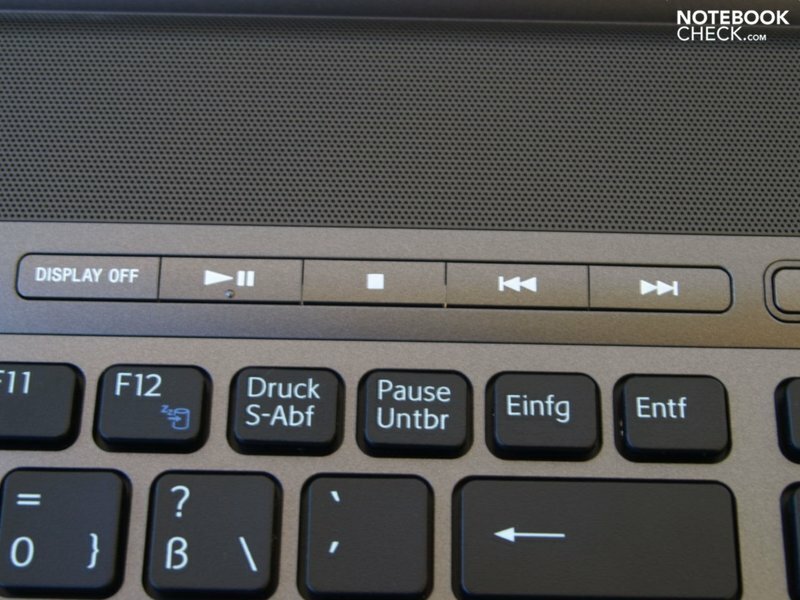 Unfortunately in detail, the F13Z still suffers from several childhood diseases (brightness distribution, fan whistle) which have no place in a notebook in such a high-end and highly-priced segment. The matte, high-contrasting full-HD display with large color space. A more even distribution of brightness on the display, somewhat longer battery runtimes.